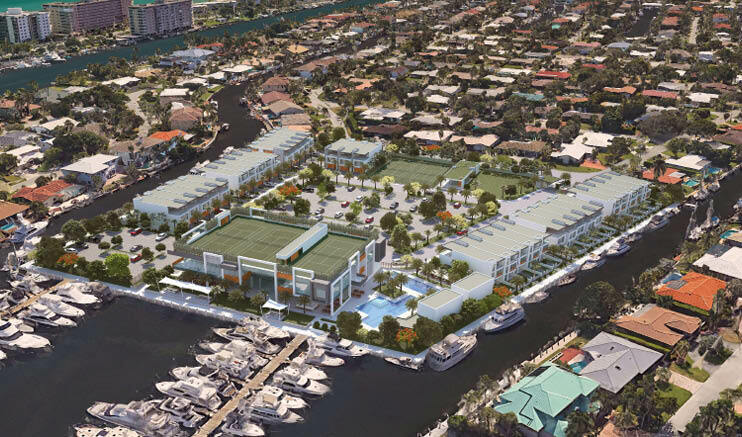 Redevelopment plans for the Lighthouse Point Yacht Club continue to make their way through what is likely to be a year-long approval process. The plans have many obstacles to overcome, as there are numerous elements that don’t meet the City’s code. The City Commission and Planning and Zoning Board held a public workshop on Oct. 22, where they reviewed a revised conceptual site plan that was submitted by the yacht club’s developer and owner, Terry Paterson, in September. Paterson is seeking a land use plan amendment which is needed to change 3.4 gross acres of the yacht club property from “commercial recreation” to “multifamily” residential, in order to build 33 three-story luxury townhomes lining the waterfront. Proceeds from the sale of the proposed townhomes would subsidize a state-of-the-art yacht club facility that would include a new 35,000-square-foot clubhouse. Patterson submitted an application for the land use change in July, along with a conceptual site plan, which were reviewed by the city’s Development Review Committee on Aug. 14 and by the City Commission and Planning and Zoning Board at a public workshop on Aug. 28. City officials had concerns about a number of issues. The revised conceptual site plan, which was reviewed by the Development Review Committee on Oct. 3, did not address those issues. The main concerns with the current plans are mass (the number of townhomes per building and building length exceed what is allowed by code); insufficient parking; valet tandem parking; commercial use of the docks behind the townhomes, which is not allowed in a residential district; not enough pervious space on the property to meet the 25 percent requirement, which affects drainage; and the front setback of the townhome buildings is 20 feet, versus the required 25 feet. Another key issue is that emergency vehicles won’t have access to all the parcels on the property. Increased traffic and traffic flow are also a concern. A number of residents who attended the public workshop on Oct. 22 spoke in favor of Paterson’s plans for the yacht club. Another resident who has been a member of the yacht club for four years said he almost left the club until he saw Paterson’s plans. At the Planning and Zoning Board meeting on Nov. 6, Paterson and his attorney, Stephanie Toothaker, discussed with the Board possible zoning changes to the yacht club property. These zoning options include an “overlay district,” which places a set of rules over a particular parcel in an existing zoning district, and if necessary can later be removed; rezoning a portion of the property from B-2A (“planned business district”) to RM-16 (“four-family residential district”); or creating a completely new zoning district for the whole parcel that’s contemplated for mixed-use. “It’s a complicated project,” Toothaker told the Board. Paterson’s request for a land use plan amendment is scheduled to be reviewed by the Planning and Zoning Board at its Dec. 4 meeting. The Board will make a recommendation to the City Commission in favor of or against the land use change. After the City Commission votes on the proposed amendment, it will be transmitted to the Broward County Planning Council for a hearing, with a recommendation for approval, denial or modification. It will then be reviewed by the Broward County Commission, and will eventually come back to the City Commission for a second and final vote.